People are always trying to cram different flavors into cheese. For years cheesemakers have managed to add beer, mushrooms, leeks, peppers, herbs, wine, sausage, bacon, and just about anything tasty into a wide variety of cheeses. It should have came as no surprise to me when I saw Whiskey Blue cheese at Sendik’s (Capitol Drive in Brookfield). I would have probably have passed this cheese by as I tend to like unadulterated cheeses (though a good chunk of brie with mushrooms finds its way into my fridge once in a while) but they had samples and it was on sale. 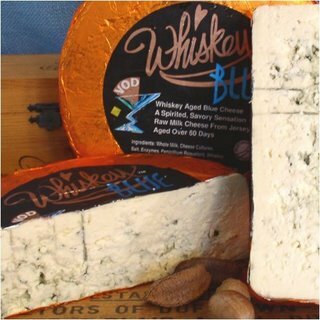 This unique cheese is a blend of unpasteurized Wisconsin blue and Kentucky Bourbon. One taste and I was hooked. The initial taste is that of a creamy blue, similar to Maytag. As the cheese melts away your mouth is awash in the distinct taste of Bourbon, though subtle hints of the cheese lingers. It is unlike any cheese I have ever tried and I definitely would recommend it to anyone who likes a strong creamy blue or gorgonzola. I could imagine this tasting incredible melted onto a grilled filet mignon or in a steak salad. Given pork’s affinity for bourbon flavors, I think topping a bourbon brined pork chop with a Whiskey Blue walnut butter would yield great results.